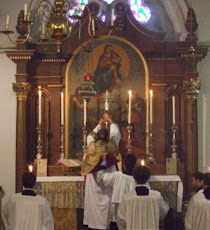 Fr Hunwicke's Mutual Enrichment: Historical Evidence? It is recorded that on one occasion when speaking to an off-message questioner about the Bishop Barros problem, PF referred to those making trouble as 'left-wingers'. I do not know Spanish, nor a fortiori do I know what whichever word he used would mean in the context of Latin American politics, or of specifically Argentinian politics, or more particularly still in terms of the former Argentine military dictatorship. So, out of the bottomless pit of my ignorance I can only articulate questions. There is, I sense, a feeling among many that we do not yet know quite everything about PF's motives and actions during that particularly unpleasant dictatorship. But there is often a revealing significance in what a man blurts out when he has lost his temper. And, on that occasion, PF had very understandably lost his temper with somebody who kept badgering him with questions he had no intention of answering. So I ignorantly wonder if this (in itself insignificant and unimportant) little outburst does reveal anything about a murkier pontifical past than most of us have hidden away in our memories? I don't think it's very mysterious. By Western standards everyone in Argentina was a left-winger, but within their milieu there were subdivisions of "left" and "right." As Henry Sire has shown, Bergoglio was a Peronist, i.e. a descendant of the Mussolini strand of socialism, which from the beginning was a splinter group from the "internationalist" Marxist-communists. Just as in Germany after the left triumphed, and everything liberal and traditional and Christian had been driven out, politics divided between the Marxist Democratic Socialists (on the “left”) and the National Socialists (on the “right”), so too in Argentina there was a split between the Peronist "national socialists / fascists" in the same intellectual family as Mussolini and Hitler, and the Marxists. Bergoglio was in the Peronist-Mussolini-Hitler line and uses "left winger" to refer to the Marxists. You may have read Henry Sire's account of the claims by two Jesuit Marxist priests that Bergoglio arranged for them to be arrested and tortured, https://onepeterfive.com/two-priests-prison-francis-buenos-aires/. It was an odd outburst that doesn't fit with anything else we think we know about him. Austen Ivereigh in The Great Reformer paints him as a "radical," a "revolutionary" and a great foe of the dictatorship. The pope's policies would qualify as leftwing in anyone's book. He may simply have used the word "leftwingers" to imply that the abuse charges came from people who simply want to challenge established authority and therefore shouldn't be taken seriously. I believe he was genuinely misled in Chile by clerics he trusted -- mistakenly, as it turns out. A quick search inspired by your article leads to an interesting piece by Ariel Dorfman, not a Catholic, or even a Christian, but his view seems to fit yours. I found the following, which might be helpful, on the Quora web site. It is an answer by journalist Cecilieaux Bois de Murier to the question: Was Peronism a right-wing or left-wing movement? I wasted about a year of my university studies in political science decades ago trying to answer this question and gave up. The answer is both and neither, which requires some explanation. I need to explain first that an “ism” in Argentina does not mean a system of ideas even remotely akin to an ideology. Rather, it means a movement that follows a particular leader. Nineteenth century dictator and strongman Juan Manuel de Rosas, who is still controversial in Argentina, still has a following that calls itself “Rosista,” even though Rosas did not not serve up an ideology but a set of gut-level slogans. Peronism was, therefore, not about a set of ideas or an agenda, but about following a very charismatic man who invariably told his audience whatever he thought they wanted to hear. In 1973, Peron welcomed the Montoneros, a left-wing urban guerrilla group of youths then inspired by Che Guevara, an Argentine, into his movement, all the while dealing with the unions, which are more centrist, and his own former military colleagues, who were always dead to the right. Thus, he left behind a movement that tries to be everything to everybody, just as he was. Both Menem and Kirchner, whose policies are polar opposites (respectively, right- and left-of-center) claimed the mantle of Peronism. What they meant was that they were willing to mumble the requisite pieties of the movement to do whatever they had in mind in the first place. That, in sum, is Peronism. Both left and right, but also neither.